Dundas Falls is 6.4 metres (21 Feet) in height and has a width of 6.7 metres (22 feet). It is a terraced classic falls that has year-round flow and derives its water from Spencer Creek. 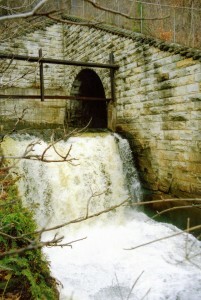 The waterfall and adjacent property were owned by the Fisher Family. In July 1863 John Fisher bought the Gore Paper Mills on the same property. Gore Mills made newsprint, carpet, felt, paper and wrapping paper. The paper mill ran day and night when the water flow was good. The mill was torn down in 1929 to provide a site for the school. At this time the waterfall and channel were reconfigured to prevent flooding at the school, thus giving it a man-made appearance. 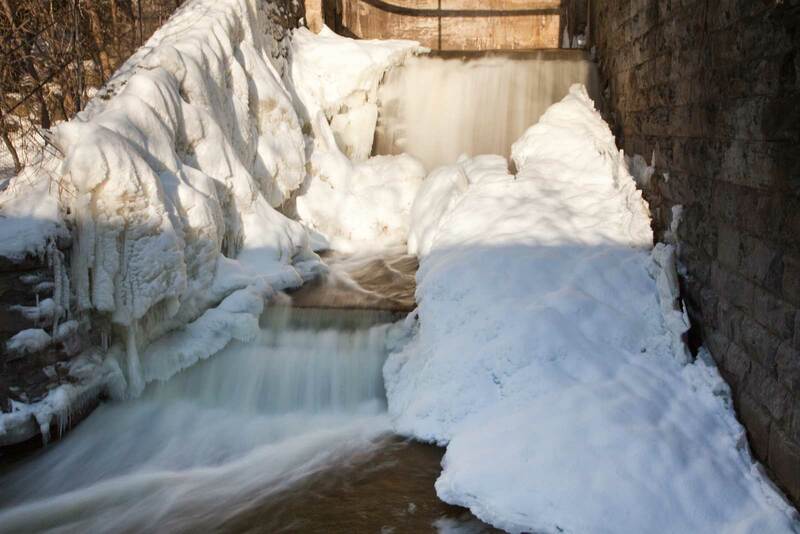 Dundas Falls is located on the CN property right-of-way about 50 m north of King St. in Dundas at the base of the escarpment between the former Dundas District Public School and the CNR tracks.